Congratulations Chef Jimmy Rodriguez for being our Chef of the Month for May! Find out what Chef Jimmy has been up to while introducing big, new flavors to the BG Florida State Parks! I was born in Havana, Cuba. I was in Cuba until I was 12 years old. I came over to America in ‘85. I currently work for BG Florida Parks. The three state parks included are Oleta River State Park, Hugh Birch State Park, and John U Lloyd State Park. I am involved in turning the state park concession stands and Blue Marlin Fish House into a better dining experience. I am implementing the use of higher quality products and standardized recipes that the entire company will follow and produce to my personal standards. My favorite kitchen tool is my chef coat. This is an important tool to help protect me from being burned and scratched in the kitchen. It also gives me a sense of pride and lets people understand that there is a professional behind the wheel, but also a graduate that loves his craft. In my chef coat, I always carry a thermometer, a flashlight, a knife and a sharpie. Taste is my strongest sense. I have trained my palate to know exactly what a dish will taste like before even needing to taste it. With my training and experience, I am able to follow a standardized recipe and use the knowledge of the ingredients I am incorporating and not need to taste the dish. Nothing has too much or too little seasoning. This knowledge has led to much of my success. You must love your craft. I hate culinary programs that fill students’ minds with the idea that “he who wants a college degree, not knowing the fire they are about to jump into, can get a degree.” College kids think they can get a degree and get a top dollar job, and it’s the furthest thing from that. Students should have a job in the industry before going to school so they know what they are getting themselves into. You have to have a love for food and for the craft. If you wouldn’t serve it to your mother, you should never serve it to your guests. If you are in doubt, throw it out. The quality of your product is a MUST. Good food is about texture and the timeliness of getting the dish to the customer. The little details are important. You want to be able to differentiate between every ingredient in each bite. No one wants overcooked chicken and vegetables and mushy carrots. I call it the Pan-American menu. Many menus now relate to all types of people and can have French style cuisine, Caribbean style cuisine, etc. all on the same menu. With my real knowledge of different cuisines from Cuba, I want to make sure all restaurants have a mixture and that everyone has an alliance to the food being served. It needs to be durable, breathable, good quality material, and washes and dries well. I prefer long sleeves with arm pockets to protect my arms and hold everything I need. What is your go-to chef outfit? Do you prefer coats, tees, pants, shorts, aprons, hats, etc.? I always wear a bandana to keep my hair out of my face. Also, I use aprons only when prepping. Don’t walk out of the prep area with an apron. The apron protects the food from you, not you from the food. Lately it has been Greek yogurt. I try to incorporate it into everything, even my Caesar dressing has Greek yogurt in it. I no longer use preservatives in my food, so you will not find any mayonnaise or sour cream in my kitchen. I preserve everything with lime juice, Worcestershire sauce, hot sauce, etc. to keep it fresh. Smaller batches with no preservatives is the secret to success. Miami. There is a wide range of restaurants in all the different areas that have been built up like the Art District and Liberty City. My Cilantro yogurt sauce. I make an emulsification of Greek yogurt, extra virgin olive oil and fresh herbs. Always organic ingredients, no preservatives. It goes with everything- fish, chicken, been, even French fries. I eat mostly at home and don’t dine out a lot. Lately I have been perfecting recipes for croquettes using different meats and fish with all fresh ingredients. I will have a line of croquettes and sauces out before 2017. My Wife! Dee Rodriguez, she is my biggest fan as well as my critic. My inspiration. In Cuba, I had been cooking since I was sitting in my grandmother’s lap. When I came to America, I used to be a tour guide and air boat Captain. At the end of the tour I would reach in and hold an alligator so people could take pictures. Eventually, my wife told me it was too dangerous, so I went to culinary school. The Marlins baseball season from last year. I didn’t watch it live, but I watch every minute of every game at my leisure. I’m still finishing last season! Chef Rutherford is humble, down to earth and very personable. 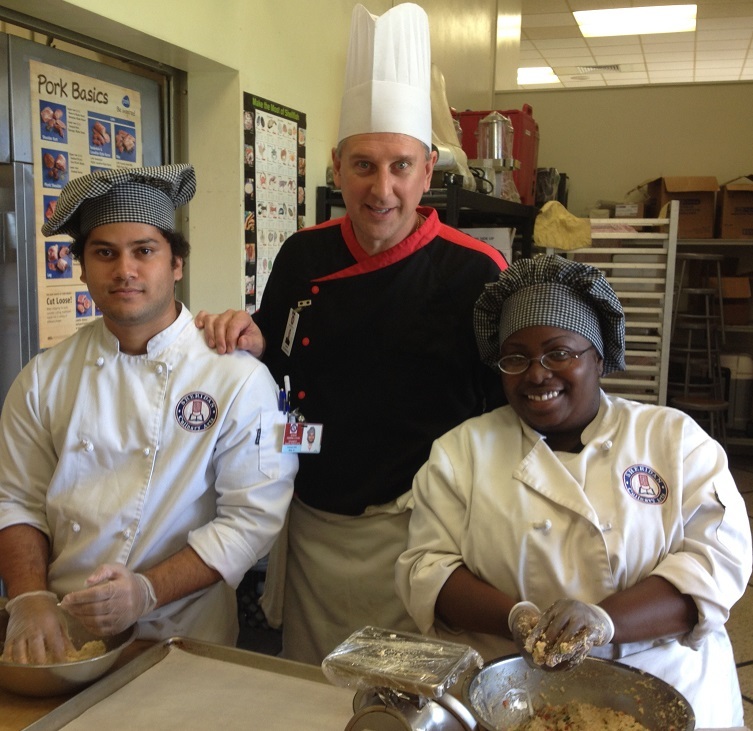 He has been a Chef Instructor for the past few years teaching his craft to young culinary students at Sheridan Technical Center (STC) in Hollywood, Florida. His focus has changed dramatically from being an Executive Chef to training the future chefs of tomorrow, something he is passionate about and shares his experience and wisdom with them. It has always been a dream of his after realizing how important the culinary school experience played a role in his own career path. In 1968, STC opened its doors in Hollywood, Florida. Sheridan is the oldest of Broward County’s three technical centers. As a Broward County Public School, STC offers postsecondary workforce development programs affording students the opportunity to gain skills in high wage, high demand occupational fields and compete successfully in the local employment marketplace. STC provides students full or part time training using the latest industry-approved technology and equipment. Their instructors are licensed and certified teaching professionals. To meet the needs of students preparing for occupations, 45 workforce development programs are offered, including 3 applied technology diploma programs and 42 vocational certificate programs. What education or experience would you recommend for aspiring chefs? 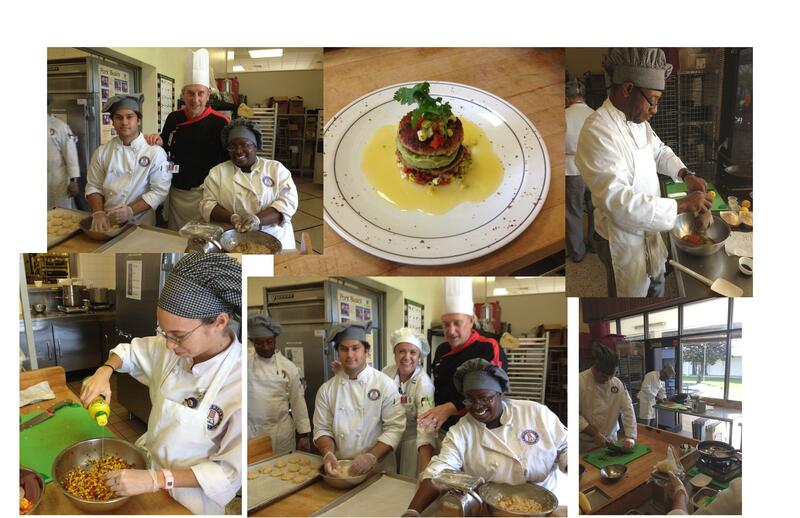 Chef Rutherford highly recommends going to a Technical School like Sheridan Technical Center once students are contemplating on choosing a culinary career as a chef. Starting with an apprentice program using the format he teaches at STC, the students can understand the basics through a short program and learn and get hands on experience and learn a lot of different techniques and styles of the culinary profession and practice what they learn. It is inexpensive, they build a good foundation with the basics and they also eat what is cooked getting exposure to casual and formal culinary styles. 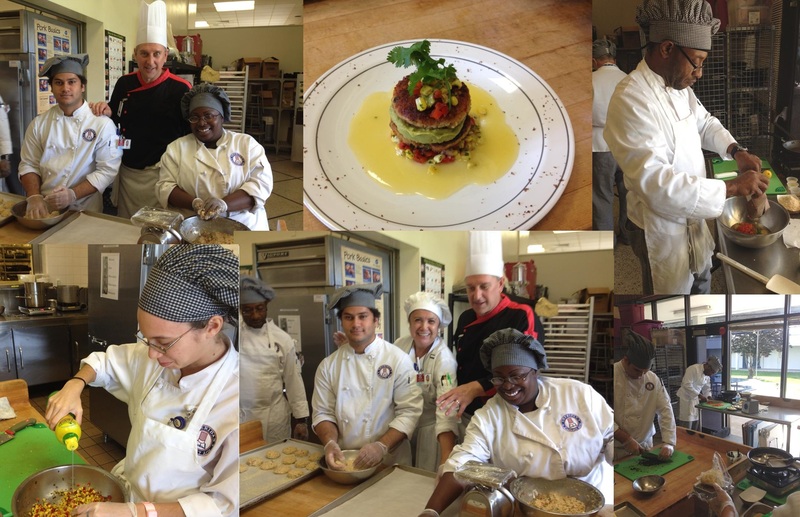 As part of the curriculum, he teaches his students in 3 courses: food handling and servsafe practices, culinary nutrition and management. They spend 30 hours a term for each class. “Experience is the best teacher and it is the little things that they will pick up from being hands-on and experimental that theory cannot teach them.” Once they decide to pursue being a chef, then he recommends going to work for a restaurant. He would not recommend working for a restaurant only as they will only learn one or two specific specialties depending on what the restaurant’s niche is. In addition to learning the technical skills, he guides them to learn to be a great manager because in moving up the career path, they will be dealing with many personalities in high pressure environments. Chef Brian Rutherford is wearing our Men’s Raglan 3/4 Sleeve Chef Coat and teaching his students how to make Crab Cakes with Roasted Corn Salsa, Avocado Butter & Lime Butter Sauce.